What’s Wrong With My Gardenias? Yellow leaves, spots, rust… – Johntheplantman's stories, musings, and gardening. Most people enjoy the beauty and fragrance of gardenias. My mother loves gardenias and that’s good enough for me. Gardenia plants are usually quick growers and easy to care for, but they do suffer from a few problems that crop up now and then. One of the reasons I write the johntheplantman articles is to answer frequently asked plant questions. A conversation came up on Facebook the other day and I am including it here. The conversation is edited and names changed for privacy. Gardenias are beautiful and fragrant but they do have some peculiarities. 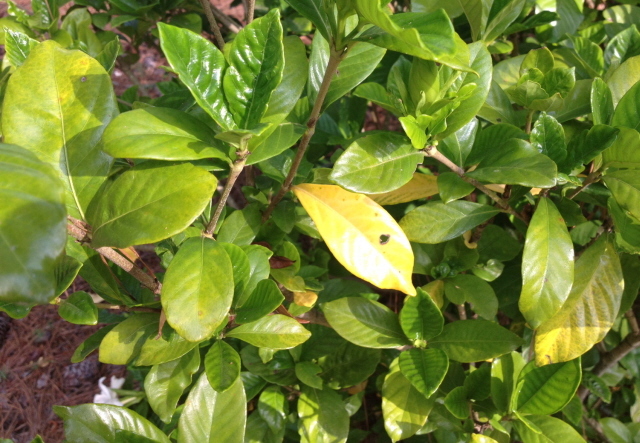 Sandra: Why are my gardenias turning yellow? Roberta: Uh, oh, If it’s just a few leaves, they’re probably all right. If it’s all turning yellow, is it too wet? Dekie: johntheplantman can help you. I learned about it yesterday. Jo Ann: johntheplantman, please help me save my gardenias! Any tips? I already know about wooden nickels. What’s wrong with my gardenia plant? The first thing we see is yellow leaves. Yellow leaves on any green plant immediately shows a lack of nutrients—mainly nitrogen. This does not necessarily mean that we need to fertilize, though. Roberta’s comment above asking if it was too wet was a good one. When the plants are too wet, a root fungus could set in and the plant cannot bring nutrients into its system. Gardenias are funny in this department. They do need the nitrogen. If you study the picture you will see a few totally yellow leaves but you will also see a yellow cast and yellow veining in other places. This is definitely a lack of nitrogen—but what causes it and how do we treat it? Gardenias are picky in that they like to have their nutrients presented to them in a most particular manner. My grandmother told me to stir up the soil around the drip line of the plant, mix 3 tablespoons of Epsom salts with a gallon of water and then pour the mixture around the plants. I tried it. I found out that the old lady knew what she was talking about. The plant regained its vigor and color. I found later that I could also pour the Epsom salts mixture over the leaves and get even better results. Try it. A week after applying the Epsom salts, you will want to mix up a balanced water soluble plant food like Miracle Grow and pour it over the plant and around the plant’s roots. Now, let’s look at that leaf a little closer. Notice the hole in the leaf that has brown margins. Below and to the left you will see a leaf with a stripe that is brown fading into yellow. These are signs of a leaf fungus. There is probably nothing you can do to restore the infected leaves, but you can spray with a fungicide (not insecticide) that will keep the fungus from spreading. A fungicide with Daconyl is a good one. A good organic fungicide is sulphur, and your nurseryman may be able to suggest something else. I don’t have a picture of it, but sometimes the gardenia plant will become covered and spotted with a black powder. If you look on the undersides of the leaves you will more than likely see evidence of aphids. It seems that the aphids excrete a substance which attracts and supports the fungus life. In this case, you need an insecticide and a fungicide. 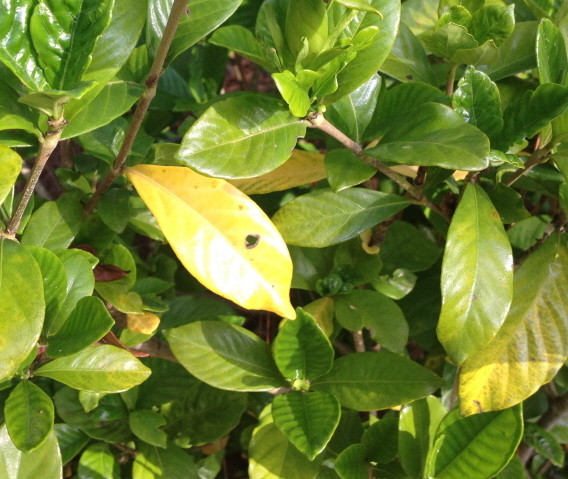 It is most difficult to get rid of aphids on gardenias. Check with your extension agent or a University near you. With any insecticide you use, remember the bees. If you really want to get organic with aphid control, you can import some ladybugs. Ladybugs eat aphids like pie. I think Auburn University has done some research on ladybug availability. I’ll have to check on it unless one of my wonderful readers beats me to it. Thanks for visiting John the Plant Man. Do try the Epsom salts. You will get almost instant gratification. Of course, you may be one of those people who find “instant gratification” a bit too slow. Sorry about that. One of the reasons I have been gone from this blog for a while is that I have been finishing off and polishing my new book, Sweetie Drives on Chemo Days. It is a funny, optimistic, and inspirational account of dealing with cancer. You may read about it here. Humor and Optimism help the cancer victim. Welcome back John. I’m going to mix up a batch of Epsom salt solution today. My gardenias look poorly. First of all I hope you are well. I have a question concerning the pruning of boxwood bushes. I am supposed to prune down some boxwoods at my friends house. Could you please give me some pointers on boxwood pruning, most importantly, when is the right time of year in northern Virginia. Your input would be most appreciated. I left your reply on the other post. Chris Byars, the best time to prune boxwoods is in January, February, or early March. This is when the growth buds are dormant. Any time is ok for a small cosmetic trim but be careful. Thank you I’ll try the Epsom salt drench. They are picky plants!! 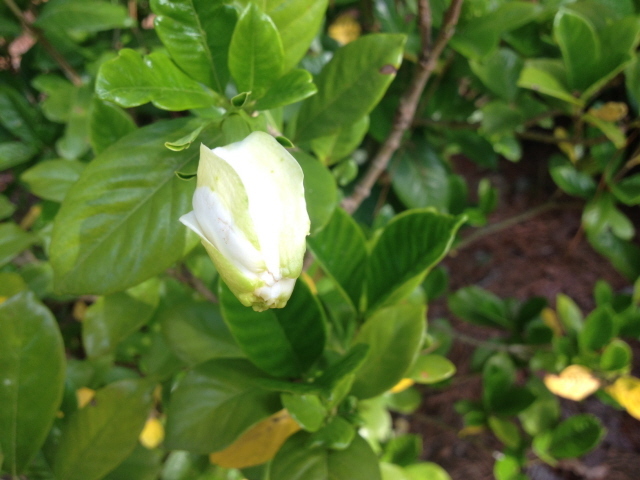 My gardenias are blooming abd their foliage is healthy. A few buds have yellow round pimples on their green shells. Help! It sounds to me like you have aphids. these are difficult to get rid of but you may spray them with a commercial compound every week until they go away. You could also get a systemic soil drench (Bayer?) and use that. A lot of people use Dawn detergent as a spray. My gardenias are blooming and their foliage is healthy. Some of the buds though have their green shells covered with small yellow bumps. Thank you John I will try this, and make sure that my Gardenias are draining well.